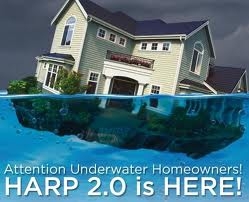 HARP 2 – underwater refinance program update … The program itself is in full swing – success if you have a Fannie Mae loan … a bit limited if you have a Freddie Mac loan. No change to the requirement that it only applies to loans sold to Fannie Mae or Freddie Mac prior to June of 2009. The HARP 2.0 program is designed to help those that no longer have 20% equity qualify for a refinance and benefit of historically low rates. In short, you have to be current on payments, and your loan has to be owned by Fannie Mae or Freddie Mac (not the same as who services your loan or where you make your payments). Generally that is going to be a conforming loan (below $625,500). Fannie Mae has a lot more participating lenders so is more successful thus far. Freddie Mac has fewer participating lenders so a bit more of a chore. Also, loans with existing mortgage insurance require a bit of care. Those are details we sort out for you … Rates are fabulous so it’s worth checking if you would benefit from a refinance to record low rates. HARP 3.0 for all those not covered by Fannie/Freddie is a pipedream. It would be really cool if the same benefit would be available for those whose loan is held by the major banks…. Not sure if it will gain any momentum given an election year … stay tuned as we are on it. Lending is hard … Good article that summarizes the current lending environment and why -despite Fannie and Freddie’s best intentions – their own actions make it cumbersome to get a loan these days … Basically Fannie Freddie and FHA may talk about loosening guidelines yet on the backside they are forcing lenders to buy back loans for minor technical infractions in underwriting. That causes lenders to adopt defensive lending and apply overlays to the underwriting process to make certain a forensic review done months and years later will not result in a loan being rejected by Fannie or Freddie. Hopefully if the federal agencies ease their buyback demands, we could see an improved lending environment soon.